Following the tradition from the three eSSENCE Academy workshops (2012 in Sigtuna, 2013 in Lund, 2014 in Umeå), we have the pleasure of inviting the community to a Swedish e-Science Academy workshop. eSSENCE has developed state-of-the-art e-Science for five years. Many collaborative efforts between researchers have evolved. Now we will have the opportunity to meet and acquaint ourselves with the exciting research that is happening within Swedish e-Science. The programme will consist of invited talks, poster presentations, and plenty of room for networking. OBS! Attendance is free of charge but a no-show fee of 1,000 SEK will be applied. Programme will be updated regularly at this site. * By car: from E4, exit 180, Märsta/Eurostop. 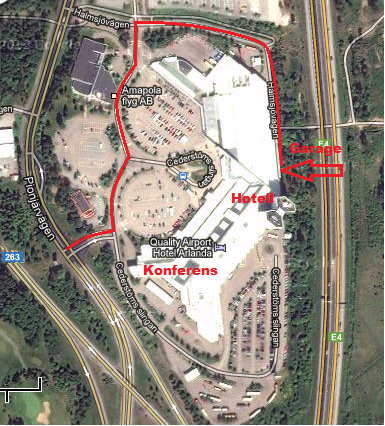 If you are arriving by car, register at the conference reception for free parking. For parking over night you need a special code to the hotel garage, which you can get at the hotel reception. Posters can be put up at registration in the Hall “Frankrike”. The format of the poster boards is: PORTRAIT, width: 72 cm, height: 180 cm. Venues: Oral presentations – Hall “Europa”. Poster session – Hall “Frankrike”. We give an overview of NLAFET, our recently approved EU Horizon 2020 project, which is a direct response to the demands for new mathematical and algorithmic approaches for applications on extreme scale systems as identified in the H2020-FETHPC work programme. The aim is to enable a radical improvement in the performance and scalability of a wide range of real-world applications relying on linear algebra software, by developing novel architecture-aware algorithms and software libraries, and the supporting runtime capabilities to achieve scalable performance and resilience on heterogeneous architectures. The focus is on a critical set of fundamental linear algebra operations including direct and iterative solvers for dense and sparse linear systems of equations and eigenvalue problems. The main research objectives are: (i) development of novel algorithms that expose as much parallelism as possible, exploit heterogeneity, avoid communication bottlenecks, respond to escalating fault rates, and help meet emerging power constraints; (ii) exploration of advanced scheduling strategies and runtime systems focusing on the extreme scale and strong scalability in multi/many-core and hybrid environments; (iii) design and evaluation of novel strategies and software support for both offline and online auto-tuning. The validation and dissemination of results will be done by integrating new software solutions into challenging scientific applications in materials science, power systems, study of energy solutions, and data analysis in astrophysics. The deliverables also include a sustainable set of methods and tools for cross-cutting issues such as scheduling, auto-tuning, and algorithm-based fault tolerance packaged into open source library modules. The MAX IV Laboratory is a national laboratory hosted by Lund University that operates accelerators producing X-rays of very high intensity and quality. Although a national laboratory, MAX IV will have many international users from the Nordic countries, EU and the rest of the world. The new facility will accommodate 26 beam lines when fully developed (Strategy Plan 2013-2026, https://www.maxlab.lu.se/strategy_report). Presently, 13 beam lines are funded and will become operational in 2016 and 2017. Five additional beam lines are currently being planned and funded.It is important to effectively manage and store the data generated by the visiting users while they perform their experiments in order for them to be able to directly assess, reduce and analyze their results. For many of the techniques that will be implemented at MAX IV it is vital to be able to rapidly obtain enough information to take strategic decisions during the experiment. There also needs to be enough storage capacity to allow enough time to transfer the data to the home institute. Provision of effective storage and analysis support will greatly improve the potential for quality results. MAX IV should also be able to act as a local hub for access to the necessary expertise. Cyber-physical systems are complex, including numerous components. They generate large volumes of events, which can be valuable means for improved, adaptive functionality in these infrastructures. This needs processing big volumes of data generated on-line, implying needs to carry out computations on-the-fly, in the streams of data, at different levels of locality in the system.The talk will provide an overview of the research and visions in the context of a set of interdisciplinary projects at the Distributed Computing and Systems group, contributing with efficient multicore and data-stream processing that can facilitate the timely extraction of information out of different sources of data at different levels of locality in big infrastructures, with examples of actual scenarios coming from Adaptive Electricity Networks, Vehicular and Communication Systems. As emphasized in several forums, efficient processing and data analysis need to be unified (cf eg article by Reed and Dongarra in CACM 2015) and this is what this research is about.Parts of the research is conducted in the projects: VR Fine-grain synchronization and memory consistency in parallel programming, EU Crisalis, EU Excess, SAFER/Chalmers-Transportation Data driven and distributed algorithms for safe and sustainable vehicular systems, GE/Chalmers-Escience/Energy EXAMINE. By taking a holistic approach to cloud resource management, the aim is to transform today’s static and energy consuming cloud data centers into self-managed, dynamic, and dependable infrastructures, constantly delivering expected quality of service with acceptable operation costs and carbon footprint for large-scale services with varying capacity demands. The presentation will provide the birds-eye’s view of the challenge as well as some glimpses of selected completed and ongoing research efforts. These efforts address fundamental and inter-twined self-management challenges assuming that there during execution are stochastic variations in capacity need and resource availability, as well as changes in system response and operation costs. Sample challenges include how much capacity to allocate at any time for an elastic application, where to allocate that capacity, if to admit an elastic service with unknown lifetime and future capacity demands, how to optimize the various management tools’ concerted actions, etc, while taking into account the need for differentiated quality of service and the scalability requirements of the management tools themselves. For further information, see www.cloudresearch.org. During the last decade several new technologies and methods has become available to researchers in cultural heritage in general and in archaeology in particular. Today the use of 3d-scanning, image based modeling, ground penetrating radar, remote sensing and 3d-gis-systems is common in any archaeological survey. These methods generates much larger datasets than earlier methods and it has been, and still is, a challenge to deal with this amount of data. Lund University Humanities laboratory in collaboration with archaeologists around the world is developing methods of collecting, analyzing and visualizing 3d-data in this context. Fusion energy research is currently in an interesting phase: JET, the world’s largest operating Tokamak, is preparing a final full fusion fuel campaign, ITER is under construction in south of France, and Wendelstein 7-X – a stellarator in Germany – is about to launch its first plasma. Over the years, modelling and simulations have played an increasingly important role in the design and the planning of operation of fusion experiments. We will here discuss the two approaches to simulation of fusion plasmas. (1) Integrated multiscale modelling, which aims towards a full discharge model for the plasma. (2) First principles modelling of plasma turbulence, which largely describes the plasma confinement.